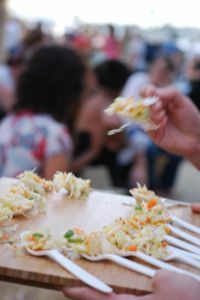 « The Street Food Craze: SF Street Food Festival and Eat Real and I'm in Eating Well Magazine! 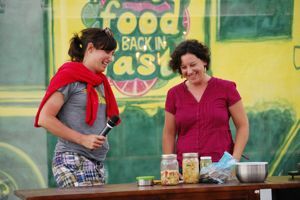 Thanks to everyone who attended my fermentation demo on Friday at Eat Real. I had a blast and it was great to see so many enthusiastic fermenters out there. As promised, here is the curtido recipe for those who did not get one and following that, a link to Nishanga Bliss' blog post about fermenting with her raita recipe. I can't recommend her blog enough, especially for people who want to learn more about nutrition and how to eat deliciously. She's a macrobiotic chef, an acupuncturist and she's working on her doctorate right now. The technique for making curtido is exactly like sauerkraut. Curtido is a great foil for rich, heavy, meaty, or fatty foods, which is why it’s so good on pupusas. I like it on tacos and beans too. Put the cabbage, onion, and carrots in a large bowl. Add the salt and, with clean hands, toss and squeeze the vegetables until they start to soften and release their liquid (about 5 minutes). Add the jalapenos and oregano and toss to distribute. Pack the mixture tightly into a one-quart, wide-mouthed glass Mason jar, pushing down on the vegetables with a wooden spoon or your fingertips with as much force as you can until the level of liquid rises above the vegetables. Put a smaller jar inside the glass jar to keep the vegetables submerged. Cover with a clean tea towel and secure with a rubber band. Leave out at room temperature for about 3 to 5 days. Check once daily to be sure the vegetables stay submerged, pushing down on them if needed. Taste daily starting on the 2nd day. The curtido is ready when it tastes good to you. When it’s to your liking, fasten the lid and transfer it to the refrigerator. It will last months in the refrigerator. It doesn’t really go bad but will soften over time. 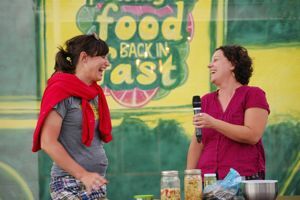 Me and fill-in MC, Michelle Fuerst, having a good time in the Scratch Kitchen. This entry was posted in DIY, classes, community, healthy, pantry staples. Bookmark the permalink. Post a comment or leave a trackback: Trackback URL.